Mustafa Farooki is the Executive Director at Tricap Investments and manages the International Investments portfolio of Al Jomaih Group. He brings with him over twenty years of experience in portfolio management. 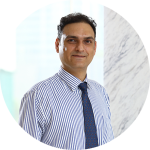 Prior to joining Tricap, he has spent twelve years with AREF Investment Group in Kuwait, setting up and supervising the International Investments Division. During his term at AREF, he managed a real estate and leasing portfolio spread in US and Europe and other direct investments while supervising a team of analysts. He was appointed on the Board of Directors of various affiliated / related companies and SPVs to oversee investments. He has also held positions in Corporate Banking at Faysal Bank and Fidelity Investment Bank Limited in Pakistan. He was awarded the CFA charter in 2005 and also holds an MBA degree.